As he neared the group, something shocking happened. No, the hummingbirds didn’t fly away and disperse. They did the exact opposite. The group flew towards the red cup in Bryan’s hand. 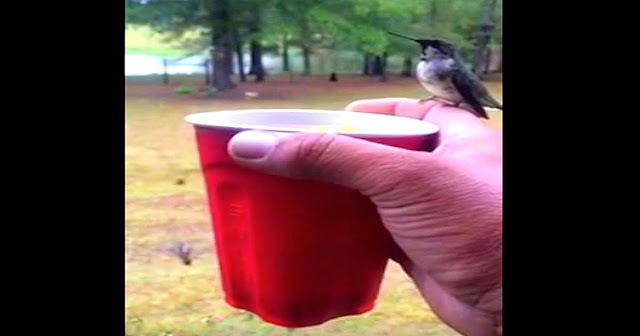 To his amazement, they began to drink and feed out of the red cup. The tiny birds flutter in place as they hover over the cup, taking turns with one another. The hummingbirds were not bothered at all by Bryan, and one even perched himself on Bryan’s hand! This is not something you see everyday, and I was not expecting Bryan to stay so still! If it were me, my hand would be shaking, and I probably would have scared them away. What a beautiful sight and experience!